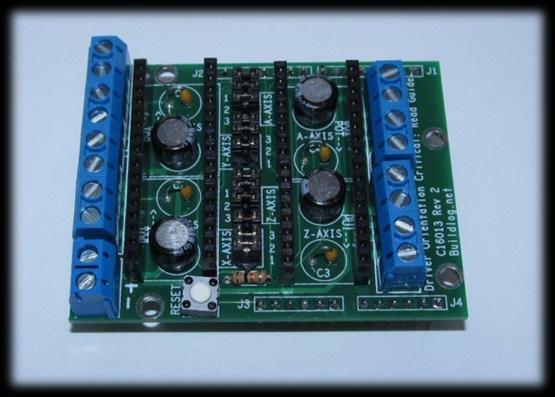 Download "Buildlog.net 4 Axis Stepper Driver Shield (p/n C16013 Rev 3) User Guide Rev 6"
1 Buildlog.net 4 Axis Stepper Driver Shield (p/n C16013 Rev 3) User Guide Rev 6 Safety & Disclaimers This stepper driver board is designed for experienced technicians only. The schematic should be studied to see if it will safely work in your system before installing or using the board. Improper use in CNC or other machines could cause personal injury or damage to expensive equipment. No circuit can be truly fail-safe. Even with properly connected interlocks and safety switches, there is always the chance for unintended motion of the motors or engagement relays. The user is the sole person responsible for the safety of the system. If at any time you are concerned about the suitability of this circuit for safe operation you can return it for a refund. Unless otherwise specified in the document, no connections should be made to this board while the board is powered. Remove power and wait for the voltage to reach 0 before making changes. Do not assume anything. Please ask if anything is unclear. Orientations and connection order are very important and might not be what you assume from previous experiences or assumed standards. License This is licensed under an open source Creative Commons Attribution, ShareAlike license. Schematics and digital files are available at buildlog.net. Go to for further definition of this license. 3 Features 1. 4 axis support with optional relay driver support on any socket. 2. Sockets for standard Pololu and StepStick stepper drivers. 3. Jumpers for microstep resolution selection (Full,2x,4x,8x,16x microstepping). 4. Reset button. Assembly If assembly is required.use the Bill Of Materials (BOM) section near the end of this document to determine the parts. Here are some tips to make assembly easier. I find it easiest to assemble the shortest parts first because they can be inserted and the board flipped over and placed on a table. There are no static sensitive parts except for the drivers. An assembled stepper driver PCB can be used to hold the mating connectors properly aligned while soldering. I use a little dab of super glue to hold the terminal blocks in place while soldering. This makes it easier to solder them straight. Be sure no glue flows onto the solder pads. The large capacitors have a minus sign printed on the device. The positive side has longer lead and goes in the square hole. 4 Arduino Port information. Function Pin Label Port Bit X Step 2 D 2 X Dir 3 D 3 Y Step 4 D 4 Y Dir 5 D 5 Z Step 6 D 6 Z Dir 7 D 7 A Step 10 B 2 A Dir 11 B 3 Enable (not 0=On) 8 B 0 The fourth axis (A) is currently not supported by GRBL. The circuit is setup for possible future expansion to a fourth axis. This axis can be used for spindle control, which GRBL does support. A special relay driver is used in the A axis stepper driver socket. The socket is too small to safely place an AC relay circuit so the relay must be located remotely. Stepper Resolution Mode Jumper 1 Jumper 2 Jumper 3 Full Step ½ Step ¼ Step /8 Step /16 Step Dual Y / A-Axis Option The fourth stepper driver in the upper right corner can be configured as an A Axis or as a second Y Axis using the JP5 jumper block. There are markings on the silkscreen: A and DY. Put two jumpers above A (connects left pins to center pins) for A Axis. Put (2) jumpers above DY (connects right two pins to center pins). Do not install any jumpers from any lower pins to upper pins. That could connect (2) Arduino output pins together and possibly damage them. 6 Bill of Materials Designator Description Source R1 Resistor, 10k, 1/4W Generic C1-C4 0.1uF 50V Ceramic Cap Generic C5-C8 47uF 35V Electrolytic Capacitor TB1 Terminal Block 2POS 5mm On Shore Technology ED500/4DS TB2-TB5 Terminal Block 4POS 5mm On Shore Technology ED500/4DS S1 Switch, Momentary Panasonic EVQ-21304M Change history Rev 1 Initial Release (Link to Old Schematic and User Guide) Rev 2 Rev 3 Removed pull up resistors for micro stepping selection. This means board is no longer compatible with Pololu A4983 drivers. Only use A4988. Added 47uF Capacitors on motor voltage at all driver locations. This reduces the noise in the stepper motors and potentially reduces a capacitor failure on the driver boards. Reduced capacitance on 5V line to comply with USB standards. Changed 0.1uF capacitor footprint Change pinout to stock GRBL 4 th axis is now configurable. DMX-K-DRV Integrated Step Motor Driver + (Basic Controller) Manual DMX-K-DRV Manual page 1 rev 1.33 COPYRIGHT 2007 ARCUS, ALL RIGHTS RESERVED First edition, June 2007 ARCUS TECHNOLOGY copyrights this document. INTRODUCTION For fabs whose wafers have different levels of reflectivity on the wafer backs, the reflective banner sensors can cause problems with wafer detection as the cassette is indexed downwards. The $25 Son of a cheap timer This is not suitable for a beginner. You must have soldering skills in order to build this kit. The $25 Son of a cheap timer This is not suitable for a beginner. You must have soldering skills in order to build this kit. Micro Wizard has been manufacturing Pinewood Derby timers for over 10 years. This gives an approximate cut-off frequency of 7.95 Hz and a passband gain of -10. 4ms Noise Swash Module Kit Builder's Guide for PCB v1.3.1 Eurorack format Noise Swash Module This guide is for building the 4ms Swash module in Eurorack format. The kit includes all the parts you need. 6. Unsolder pin #4 and remove 3.9K (R211) and replace with 39K 2-Watt resistor. Whale 3. User Manual and Installation Guide. DC Servo drive. Contents. 1. Safety, policy and warranty. 1.1. Safety notes. 1.2. Policy. 1.3. Warranty. User s Manual. For TB1H. High Performance Microstepping Driver. Attention: Please read this manual carefully before using the driver! Induction Power Supplies 3kW; 135 400kHz (Integral Heat Station) User s Guide Model 3-135/400-3 Model 3-135/400-3W Rev E 12/1/04 Table of Contents 1. SPECIFICATIONS AND FEATURES...3 1.1. Output...3 1.2. Appendix A STEPPER-MOTOR BOARD IN DETAIL The schematic for the stepper-motor controller board discussed in Chapter Eight is shown in Figure A-. Its V power is supplied by a wall-transformer power supply. 28-PIN IN IN PROJECT BOARD Contents: AXE020 28-pin Project Board with input/output cables Introduction The 28-pin project board is designed to allow rapid prototyping with 28-pin PICAXE microcontrollers. CHASER LIGHTS. Rainbowkits.com has many more exciting kits to choose from that are easy and exciting to build!